This year, the Lexington-Fayette County Health Department has plans to help fight flu in the community and test its emergency preparedness by offering free flu shots via #FreeFluDriveThru, to be held Oct. 9 at Imani Family Life Center. Help us get the word out about this event! How? It’s easy! Request copies of the above flier from Greg Hiles or Kevin Hall via email (it’s available in 11×17, 8.5×11 and as half-pagers, in both English and Spanish — in your request, please indicate how many copies you would like). You can distribute these promotions at upcoming events, health fairs, or with your local neighborhood association, apartment complex, church or stores. You can even help spread the word online! Keep an eye on the Lexington-Fayette County Health Department’s Facebook and Twitter pages and share our messages as they appear, or click on the images below to enlarge the pics and save them for use on your own social media pages. 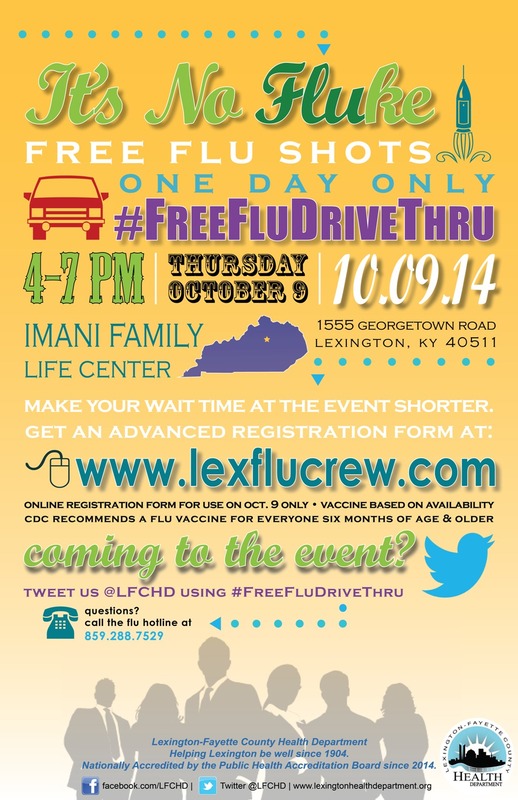 www.LexFluCrew.com will provide updates on #FreeFluDriveThru and all-things flu throughout the season. In fact, individuals can also save time at this year’s flu shot event by printing off an advanced registration/vaccination form from the Flu Crew site, filling it out completely and bringing it to the event.